So here in Vermont summer takes a long time to get started, but then when it does everything bolts immediately. (For you non-gardeners that means all your herbs/salad greens/etc start flowering, which isn't so good for your yields). I finally gave up trying to keep ahead of the flowers, and cut a whole bunch. Unfortunately, you can't really cook with basil flowers, as their texture isn't very good. The solution? 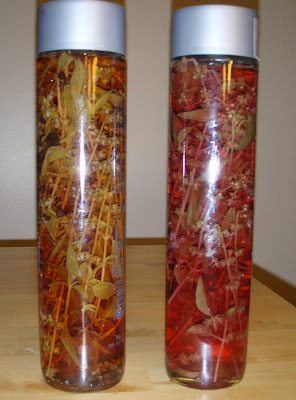 Find an old glass bottle, stuff the flowers in it, and add cheap white vinegar. Surprisingly (to me, anyway) the purple flower stalks turned the vinegar a bright pink colour, so now I have a pretty bottle of basil vinegar. Tasty and decorative... what more can a poor grad student ask for? (Other than an increased stipend, but we all know that's not going to happen until they're handing out down parkas in hades). The bottle on the left has peppercorns thrown in as well; I actually didn't like the flavor of that as much, and will stick with just basil in the future. Ooh, pretty... I wonder how it might work with mint? Or is that just too odd? Well, you could, and you'd probably very successfully create mint vinegar. Not sure what you'd do with it, though... maybe as part of a thai salad dressing?